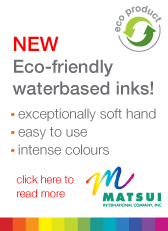 The Mutoh printer range for water-based inks is targeted at businesses focusing on the production of high-quality graphics for indoor and short term outdoor use. 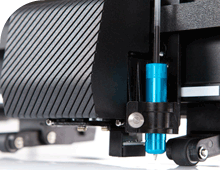 For regular poster printing applications on a wide range of coated substrates, the printers can be loaded with water-based dye or pigmented inks. 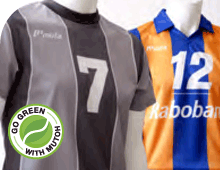 For soft sign applications, the printers can be loaded with Mutoh disperse dye sublimation inks. Our range of cutting plotters, developed for sign professionals, are suited for regular vinyl cutting as well as automatic contour cutting of pre-printed full colour stickers. 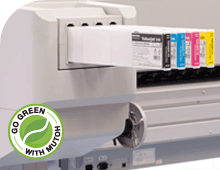 Mutoh, a trusted brand of large format and Dye Sublimation printers has partnered with National Screen and Digital Supplies to distribute their range of eco-friendly printers. NSDS have branches nationwide thereby offering you convenient availablity on consumables and service. Print buyers and print consumers are increasingly aware of printing's environmental impact. These customers want wide format inkjet printers to do more than simply print on recyclable/recycled materials. They are looking for printers to operate in a more efficient and sustainable manner, from start to finish. Making the right equipment and workflow decisions has thus become even more important. Printers are looking for ways to compress the entire production cycle, use less material and produce less waste while ensuring profitability, quick turnaround and high quality. Reduce energy use. Building energy consumption is around half to one third of that used for production. Readily available savings often include lowering heating levels, not lighting areas not in use, excluding draughts and heat loss and computerizing control of heating, ventilation, air conditioning and other support systems. New lighting technologies can reduce the energy needed by 50%. Include energy consumption when selecting new equipment. needed to cure them. Ink manufacturers are increasingly using renewable resources. Together with printing equipment suppliers they are also assisting printers to recover and recycle inks and solvents. the Endorsement of Forest Certification (PEFC). regulations in function of the supplied MSDS sheets. conserve natural resources and to enhance efficiency and profitability.